Despite the name, Far Cry 5’s first batch of DLC – Hours of Darkness – can easily be beaten within 20 minutes. I did just that – yes, me, the guy that anyone of a sensible mind would vote least likely to become a speedrunner. The reason I was able to do that is because Hours of Darkness gives you just one mission as you don the M1 helmet of Hope County resident Wendell ‘Red’ Redler: get the hell out o’ there, soldier! After a routine patrol goes sour – and with the ensuing .50 calibre gunfire of the North Vietnamese Army not exactly agreeing with the structural integrity of your helicopter – you and your fellow squaddies inadvertently find yourselves captured by Ho Chi Minh’s soldiers. Once you have wriggled free from your communist captors, you can make a beeline for the evac zone marked a couple of clicks north. You can do this alone if you wish, but only if something about the napalm-induced infernos and almost inevitable oblivion gets the better of you. Got the taste for active service? Here are the best war games on PC. The story is introduced through graphic storyboards that recall Far Cry’s most famous spin-off, Far Cry 3: Blood Dragon. But, make no mistake, Far Cry 5: Hours of Darkness is much more po-faced than 2013’s ‘80s action film parody. If the maxim ‘leave no man behind’ is more of a hard-and-fast rule than a mere suggestion, it is up to you to bring these lost boys home on your way to your – at least for now – cult-free farmland home. Hours of Darkness does have greater consequence to it in these crucial moments, though: botch a rescue attempt and your guys are gone for good. If you are successful, you can choose up to two of the fellas to be your guns for hire. But where the specialists in the main game at least proved a little useful before getting more annoying with time, these erstwhile captives are dull from the start. 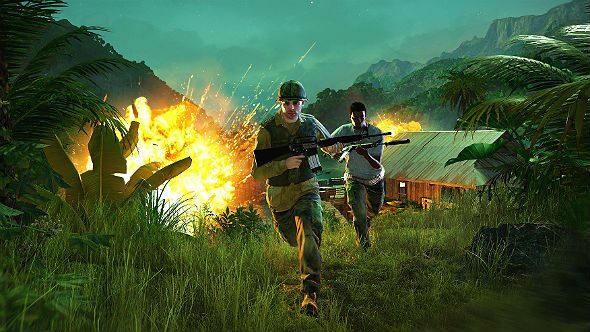 You will also be doing tasks that will be familiar to seasoned Far Cry players – which you might not be as Hours of Darkness can be picked up as a standalone game. From destroying megaphones that shout propaganda into the treelines to hunting for the cigarette lighters of deceased soldiers and clearing out your typical outposts, filling your next set of progress bars will quickly feel rote. That said, your chunk of the Vietnamese warzone is not littered with icons as the other games are, and you can race to the finish when you see fit. Towers were binned in Far Cry 5 but the anti-aircraft emplacements found throughout Hours of Darkness perform a similar function. You might have the airborne firepower of the US army at your beck and call, but that is only when they are not being swatted out of the sky by these fearsome guns. When you destroy an emplacement you collect intel on the next NVA assassination target or lighter location and it allows your helicopters the freedom to rain down airstrikes on the bad people. Venture out to a new area with another set of the AA blighters, however, and you will have to destroy more. It’s understandable if you cravenly miss everything in Hours of Darkness and scarper for the credits: its open world has the upsetting stain of war all over it. The hills that loom over Vietnam’s scorched fields are shrouded in smog. The weight of the humid air mixed with the smoke of bloody execution is hauntingly heavy. Your trudge will feel increasingly poignant as you see lush green fields give way to lifeless hellscapes saturated with bright orange gas that will make you cough like a hag. As the desperate tenants of this newly spoiled land, the Viet Cong will use the environment against you. Crouching amid the tall reeds, ready to strike at the slightest note of movement, they feel as if they are everywhere despite the impression that spontaneous events feel reduced in their regularity compared to the main game. This is even true for when they are making their escape: if you fail to dispatch your NVA assassination target quickly enough, they may make a dash for it in the network of subterranean tunnels that snake their way beneath the battlefield. Rather than fight your conditions by going in guns blazing and risking being overwhelmed, the stealth approach is recommended – at least in your first playthrough before modes like ‘Action Movie’ are unlocked. In ‘Normal Mode’ your arsenal is limited as one of your three main weapon slots is locked. Also, in place of a progression system, you have four perks that act as a sort of multiplier: performing certain stealthy acts will unlock perks – such as quicker enemy tagging and faster movement while crouching – for as long as you remain undetected. It might be watered down relative to the full skill tree of the main game, but it makes sense in this oppressive hellscape. Odd, however, is the absence of the drugs system which allowed you greater speed and damage if you craft certain narcotics. Here, you merely pick three plants to craft a med kit, which is a curious omission considering the rampant drug use of US soldiers during the historical conflict. Far Cry 5: Hours of Darkness’s star is its intoxicating theatre of war, but this does not stop this first piece of Far Cry 5 DLC from feeling empty. 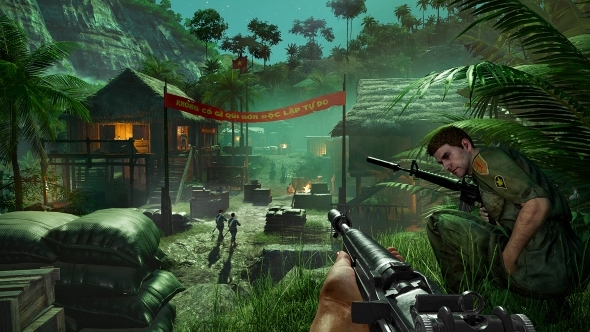 Outside of one simple mission, the rest of your activities are the same filler with which Far Cry players will be all too familiar. As a mindless mess of gunfire and explosions, your sole goal lacks impact when you come to it, too. In the end, you will ask yourself why you are there at all which, when you think about it, is probably a stronger allegory than anything the main game could muster.